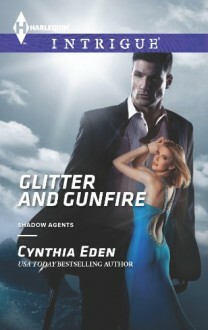 HE WAS ASSIGNED TO PROTECT HER--NOT MAKE HER HIS OWN-- IN THIS INSTALLMENT OF USA TODAY BESTSELLING AUTHOR CYNTHIA EDEN'S SHADOW AGENTS SERIES.Cale Lane had his orders: keep Cassidy Sherridan alive at all costs. But who sent six armed men storming the Rio ballroom to take her out? The gorgeous party girl wasn't giving it up. Now he had a more urgent mission: uncover Cassidy's secrets...one by one.Cassidy didn't need the former Army Ranger to play hero and blow her cover. Using herself as bait was the first step in bringing a killer to justice. How could she do that with Cale shadowing her every move...and awakening feelings that tempted her to put her life-and heart-on the line? This explains so much: Cassidy is an idiot. I was interested in Cale's story, but this was just a disappointment. A TSTL woman with a death wish seems to think that she can take down a kidnapping slash extortion slash murder ring all by her lonesome. I can't keep reading this nonsense.